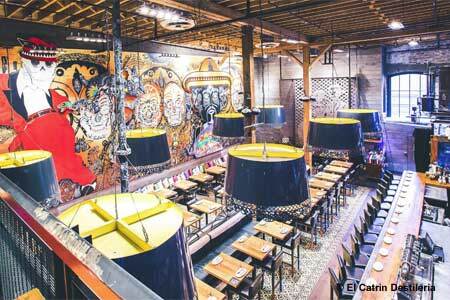 Canada’s largest mezcal-tequila bar and authentic Mexican tapas at the heart of Toronto’s Distillery District. : Agua frescas are refreshing, but the real pull is the bar at this Distillery District venue, featuring the largest selection of mezcal and tequila in Canada. A mural, hand-painted by three Mexican artists, brightly adorns the room, while robust black chandeliers cement the playful space. Tapas-style dining makes this spot appropriate for groups, so expect to dive into the likes of tuna ceviche, bright with tangy lime and sweet mango, or the Baja tacos filled with crispy, hot, flaky cod and smoky chipotle-lime coleslaw. Try the multi-course tasting menus for some diversity, or attend the brunch. For dessert, sample the corn cake accompanied by guava sorbet or classic churros with an array of dipping sauces.